Have you ever been wandering down the store aisle and come across a new item that peaked your interest? I see fun new things at the store all of the time. Some look helpful, some look delicious, and some look ridiculous, but I always find myself wanting to see what it does/is/tastes like. But, if your family is anything like our family, there isn't a lot of flexible income to spend on items that may or may not be liked. Did you know that there is a way around that? And no. I'm not telling you to go shoplifting. It may be a way to get products, but I like to stay 100% legal. I do two types of product reviews. Some of them are blog related, and you see them here. Those reviews are only available to bloggers. But the other type of product reviews that I do aren't related to blogging at all! The non-blogging related product reviews are what we are chatting about today. I've had several people ask how I get so much free stuff, so I want to fill you in on how to do it! I've been doing product reviews since...well, probably since we got married and before I started blogging! There are companies that exist solely to provide consumers with items in exchange for their honest reviews. It sounds too good to be true, but it is totally legitimate! Now, you can't make a living off of it, but if you have a few minutes of spare time every now and then, it's a nice way to splurge on yourself, without splurging out of your pocket. I'm currently part of three different product review companies. They all function differently, and offer different products, so I thought it might be nice if I break them down for you in three different posts. Then you can choose the one that best fits you...or you can be like me and do all of them! Let's start with my favorite product review company: Influenster! 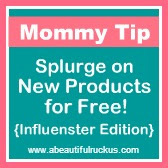 Influenster is a product review company that I only found about a year ago, so I'm still a relative newbie to it. Most review companies send out items one at a time, but Influenster sends out 4-5 different full sized products at a time. I LOVE the way they do it! It's like Christmas when I get to open the box full of items that are just for me! 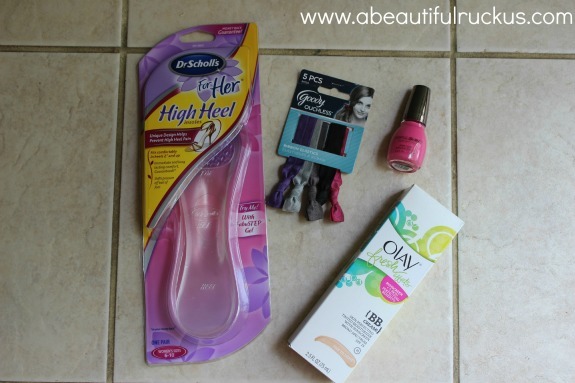 Typically, Influenster picks a theme for the box. Previous themes that I've participated in are: Sunkissed, Cosmo, and Sugar n' Spice. The products inside might be from different companies, but they all play together to create the theme. Influenster lets you know what the theme is when they are looking for campaign participants, but the contents of the box are a surprise! The Sunkissed VoxBox: I didn't like BB cream until I tried the Olay version. I never would have found it if it hadn't have been for this box! So how does Influester work? First, all participants have to apply to be part of the program. It took a few weeks for my application to be approved, so be patient if you apply! It's worth it! Once you receive the email that says that you are officially in, you will want to immediately set up your profile in your dashboard. It's very important that you fill it out as much as possible. When companies are setting up a campaign for their product, they give the review company the demographics of who they are looking for. If you haven't answered any surveys or filled out your profile, you won't get asked to participate because they won't know anything about you. The more information that you provide, the better your chances of being chosen. Influenster also has something called Expert Badges. You are allowed to choose up to five Expert Badges, so choose carefully! The Expert Badges are basically a way to show them that you are an expert, hobbiest, or just plain really love a certain area of life. For example, my Expert Badges are: Sweet Tooth, Chowhound, Six Pack, Urbanite, and Beauty Queen. So my areas of interest are sweets, food, being healthy, living in an urban area, and wearing makeup. They have a bunch of other ones, so make sure you read through the descriptions before choosing! Those Expert Badges signal to Influenster what types of products you will like to review. Within each of the Expert Badges are tasks that you can complete to raise your score in that area. Things like writing reviews about products you already have and love in your home, answering questions for other participants about that area, and completeing surveys all raise your score. And the higher your score goes, the more likely you are to be chosen for an Influenster campaign! Let's assume that you've completed your profile, you have your five Expert Badges chosen, and you've finished several tasks under each one. So how do you get to the good part? The part where the box shows up on your doorstep?? As products come in, Influenster will match your profile to the demographics required by the product company. If you match, then you just might get an email! If you get an email, you aren't quite in the campaign yet. They will ask you to fill out a pre-qualification survey directly related to the products to see if you are indeed the right fit. Can you blame them? You are going to be sent a box FULL of stuff to try! I've been invited to apply for four campaigns, and I been accepted into each one, so as long as you are honest and fill out the pre-qualification questions to the best of your ability, it shouldn't be a big deal. If you are chosen, then Influesnter will send you an email that your box is on it's way! Palmolive VoxBox: I really loved the Lime Basil scent! The fun part begins when your box arrives! Once your box arrives, Influenster will give you a set of tasks to complete related to it. It's important to know that the tasks are completely optional, but the Post-Campaign Survey (at the end of the campaign) is required. Note: If you miss the Post-Survey at the end of the campaign, you won't be invited back to participate again. No second chances on this, so make sure you follow through to the end if you accept a box! Personally, I suggest that you do as many of the tasks as you can. I tend to do almost all of them except for Vine (which I haven't figured out yet) and blog about them individually (not sure if you all would like that?). Even though the tasks are optional, it shows a good faith effort on your part. It's true that the products are free, but the company is expecting feedback in exchange for them. Part way through the campaign, which generally last 4-ish weeks, additional brand specific tasks open up. Again, those are optional, but you can win some really cool prizes by being one of the reviewers who has completed the most activities. I've never won a prize, but maybe someday. You will get email reminders as the campaign goes on, and after you complete your post-campaign survey, which takes about 20 minutes, you are finished. Well, almost. Make sure everything is up-to-date in your profile so that you are ready when the next batch comes around. Why is Influenster my favorite product review company? Although there are more hoops and requirements to jump through with this company, they provide some of the best products that I've been able to try. I also really like that 4-5 products are in every box, so I'm not constantly applying for reviews on single items. And the task list is very easy to understand and follow. I consider it a very user-friendly program! The downsides, are that campaigns that I qualify for only come around every 4-6 months (in my experience). I'd love to do them more often, but I really enjoy what I do qualify for! Cosmo VoxBox: Is that Taylor Swift's RED perfume and a Ghiradelli Caramal and Sea Salt Chocolate Bar? Why, yes! Yes, it is! I LOVED this box! By agreeing to receive a product or box, you are agreeing to review it. If you can't or don't want to review it, it's important that you turn it down. I've turned down campaigns before and it hasn't hurt my chances of future campaigns. The companies would much rather you just say "no" up front, than send you a box and not get your feedback in return. In other words, treat the companies fairly, and they will treat you fairly in return! I will add that free stuff is never truly free. There is always a cost associated, and in this case, the cost is your time. However, if you have more time than money, product reviews can be a great way to splurge without spending money! this seem like something that you might want to try? No affiliate links are contained in this post. I just want to help fellow mamas out! This was an excellent breakdown of Influenster, which is something I've been meaning to look at more closely. Thank you! I really found it helpful! I just joined Influenster this morning, so I was so excited to see this post, great info! Are you able to tell what has been the most valuable in getting you campaigns... surveys, review, etc? This looks really interesting I am definitely going to check Influenster out! Great blog! We have just started following and love it :) Maybe you would like to check us out and follow back? Thank you so much for this explanation!!!! Very useful. I'm going to go for it as well as tell family about it. Can't wait for your other posts! I just started with influester yesterday after hearing so many good things about the company and am excited to start working with them. Thanks for the great info on how it works. Thanks for the tip! I'm totally going to check it out. I've done other try-products deals like Smiley360 and another one, I forget who it is. Anyway, this one sounds great ! Wow! This looks really fun. And I love taking surveys and talking/writing. This sounds like a win/win for me! Got my first VoxBox today :) Thanks for this tip, else I would not have known about it. Now time to get working on it! Thanks so much for sharing! Because of you, I signed up for @Influenster, got my #MamaVoxBox and loved it!